Buddhist deities portrayed with one leg crossed over the other and a hand held up to the cheek are called “pensive” Bodhisattvas, in reference to the state of deep contemplation that this pose represents. This type of image originated in India, the birthplace of Buddhism, and was later transmitted to China, and Korea, and Japan. Many sculptures of this type were created in Japan and Korea from the 6th to 8th centuries, including ones that are now considered masterpieces of ancient Buddhist sculpture. Counted among these is a National Treasure preserved at Chuguji Temple in Nara prefecture. Its face, embellished with a gentle smile, is recognizable to nearly everyone in Japan. Another such masterpiece is in the collection of the National Museum of Korea. Made from bronze, it is well known to countless individuals in Korea as “National Treasure No. 78.” The fact that two exemplary sculptures with similar forms remain to this day in both Japan and Korea, speaks of the deep interactions between these two nations since ancient times. 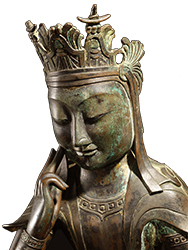 This exhibition is a truly unique opportunity to savor the beauty of Buddhist sculpture from both Japan and Korea. 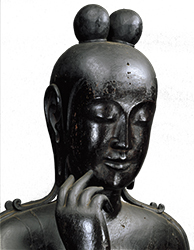 Preceding this exhibition, the two statues from Chuguji and the National Museum of Korea are featured in the special exhibition Pensive Bodhisattvas: National Treasures of Korea and Japan at the National Museum of Korea in Seoul, from Tuesday, May 24 to Sunday, June 12, 2016. 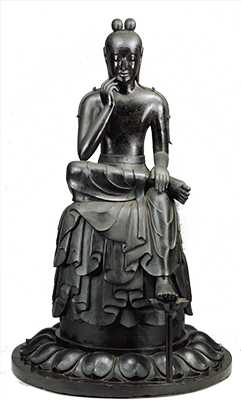 This Bodhisattva is seated on a round stool-like seat with the left foot placed on the ground and the right leg crossed and resting on the left knee. The right hand touches the cheek in a pensive, or thoughtful, pose. Although the half-lotus position usually refers to sitting with both legs crossed with one foot resting on the other leg, in the case of pensive bodhisattvas, the term denotes this position with one foot on the ground. Two round buns on the top of the head represents the hair, with strands hanging down onto the shoulders and arms. The face is oblong with rounded cheeks, in a gentle expression given by downcast eyes and a soft smile. This gentleness is also conveyed through the flesh of the upper body. A dent is delicately expressed along the spine in a realistic manner, demonstrating the expertise of the sculptor in depicting the body. Remnants of skin-toned coloring seen on some parts of the body now mostly in a lustrous black, suggests that the softness of the skin was even more pronounced when the statue was made. 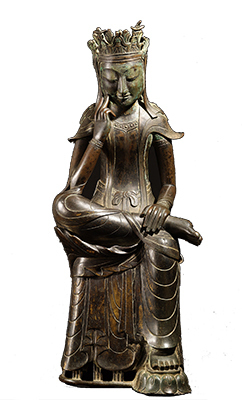 This pensive bodhisattva is made from camphor wood, which is characteristic of wooden Buddhist sculptures of the Asuka period. However, the notably deliberate way of interlocking the wood material is unique to this statue. For instance, the right arm and fingers carved out from a single piece of wood are jointed to the shoulder using a small piece of wood to adjust the subtle angle of the fingers to the cheek. There are various theories regarding the identities of seated pensive bodhisattvas with the right hand touching the cheek and the right leg crossed over the left knee. On the Korean Peninsula, many of these statues were created to represent the Bodhisattva Maitreya, the worship of which was particularly prevalent. The downward cast of the eyes and face give the appearance that the Bodhisattva is meditating deeply as it prays for humanity’s salvation. The large head, hands and feet, as well as the smooth, slim body, and the carved lines that form wave-like folds in the garments are of a style that was popular in the Three Kingdoms period. These characteristics, which are also featured in gilt bronze Buddhist statues from the Asuka period in Japan, succeed in expressing the sublime figure of the enlightened Buddha. This statue is one of the larger gilt bronze Buddhas of its kind. Scientific analysis undertaken in recent years by the National Museum of Korea has led to the supposition that, by creating the mold in three parts—head, body, and the small lotus flower under the left leg—the sculptor was able to keep an even thickness of around four millimeters throughout the bronze casting. While it is said to have been unearthed in the former kingdom of Silla, in what is now North Gyeongsang Province, its provenance has not been confirmed. However, given its sophisticated form and advanced casting techniques, it is likely that the royal family was involved in some way in the creation of this statue. Advance tickets will be on sale at the museum ticket booths (during museum opening hours excluding the last 30 minutes), Lawson Ticket (L-code: 34248), e-Ticket Pia (P-code: 767-624), Seven Ticket (Seven code: 046-526), E-Plus and other major ticketing agencies from Friday, May 20 to Monday, June 20, 2016. * Special exhibition "A Journey to the Land of Immortals: Treasures of Ancient Greece" (Tuesday, June 21 - Monday, September 19, 2016, Heiseikan Special Exhibition Galleries) requires a separate admission fee. A total of 100 yen discount will apply to day tickets when both special exhibitions. * Special exhibition "A Journey to the Land of Immortals: Treasures of Ancient Greece" (Tuesday, June 21 - Monday, September 19, 2016, Heiseikan) requires a separate admission fee.